Oh soup, where have you been all my life? Seriously, I have never made this much soup in my life but now that I’m on this kick I just don’t want to stop! When I’m roaming around for recipes, the first two stops I make are allrecipes.com (gotta love a recipe that’s reviewed) and simplyrecipes.com. 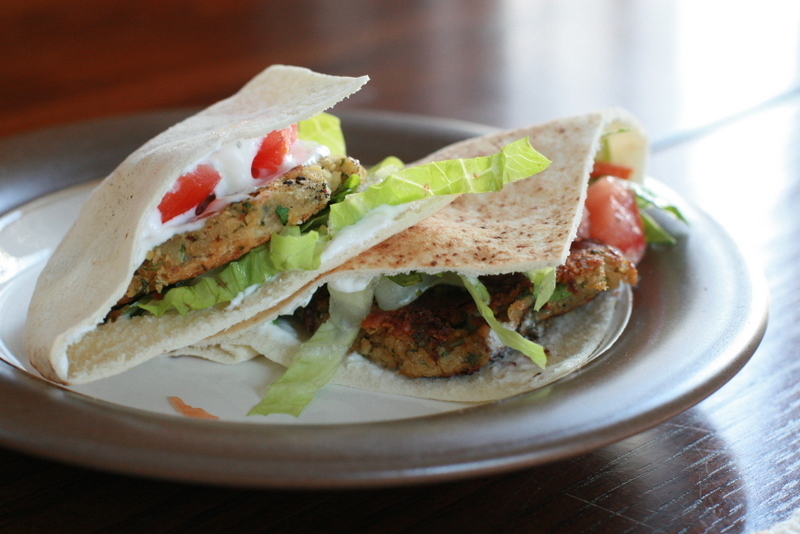 There are no ratings at Simply Recipes but there are lots of reader comments and I’ve made enough of her recipes to feel confident that she knows what she’s talking about! 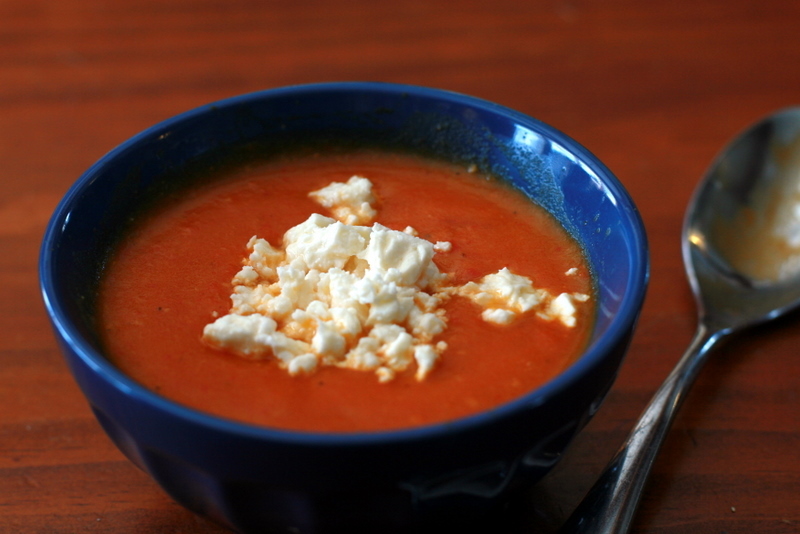 So when I went looking for a red pepper soup recipe, I went there first and found this recipe for Roasted Red Pepper Potato soup … it looked simple, without a lot of ingredients to crowd the red pepper flavor, but with the added heartiness of the potato. I knew it would be a winner and oh, it did not disappoint. Heat the butter in a large soup pot over medium-high heat. Add the chopped onion and saute for 2-3 minutes, stirring occasionally. Add the potatoes and cook another 1-2 minutes. Add the garlic and peppers. Stir well and cook for 2 minutes. Add the stock, stir, and bring to a simmer. Cook over medium heat until potatoes are soft. Puree the soup until very smooth. I use an immersion blender but you can also use a blender or food processor (in batches, if necessary). Over low heat, add cream, stir well, and taste. Add cayenne, salt, and pepper to taste. Categories: Recipes: Soups | Permalink. 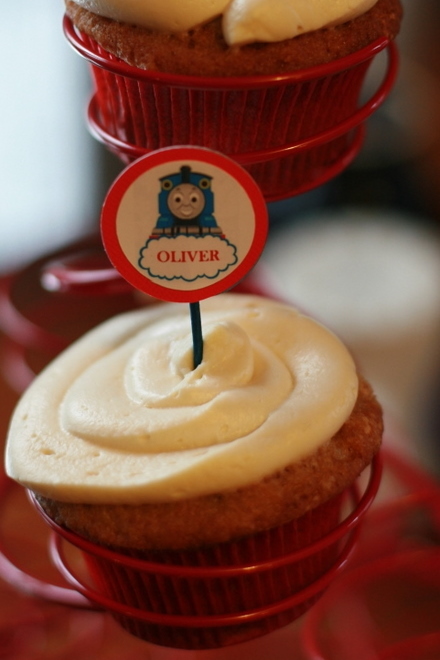 I made these cupcakes for Oliver’s birthday party with his little playgroup friends. The banana cupcakes (recipe here) were made a couple of weeks ahead of time and frozen (yay for being prepared), so all I had to do was pipe the icing on before the party. 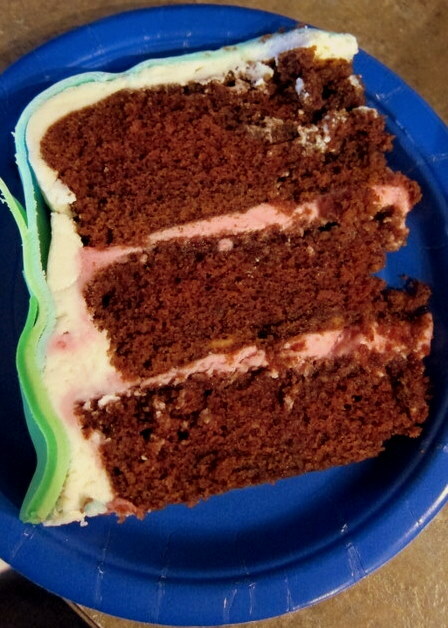 And the frosting – mmmm! What a nice change from regular cream cheese frosting. The only change I made was to bring down the amount of almond extract a bit because it was a really overwhelming flavor. Next time I’ll start with the 1/2 tsp and add more if I want to. They seemed to be a hit with the kids (okay, and the mommies too)! Cream shortening and sugar. Add the eggs, vanilla, bananas and buttermilk. Combine the flour, baking powder, baking soda and salt; add to banana mixture. Fill 18 paper-lined muffin cups two-thirds full. Bake at 350 degrees for 15-20 minutes or until a toothpick comes out clean. Remove to wire racks to cool completely. Melt butter and allow to cool. Combine cream cheese, butter, brown sugar, vanilla, and almond extract. Beat with a mixer. When mixture starts to stiffen, stop mixer and add honey. Continue to beat until light and fluffy. Do not over mix or it will collapse. Spread on cupcakes immediately and store in refrigerator. Categories: Recipes: Desserts, Recipes: Oliver-approved | Permalink. 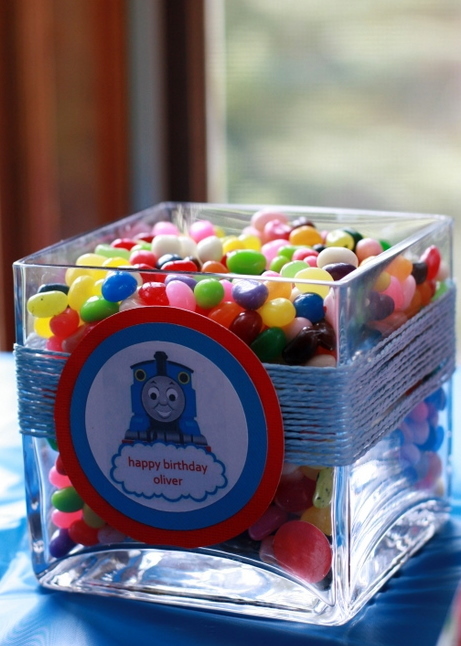 I take great pride in finding the time and making the effort to give Oliver something homemade for his birthday. I know he doesn’t really appreciate the homemade quality of these gifts yet but I hope he will look back at some point and see the love and thought that was put into them. In the meantime, it’s fun for me to pick out the fabrics and make the gifts (and usually a learning experience since I still consider myself a beginning sewer!). I didn’t intend for both gifts to fall into a “beanbag” theme. But both of these projects have been on my list for a while and just seemed so fun for Oliver – I mean, what kid didn’t play with beanbags growing up?? 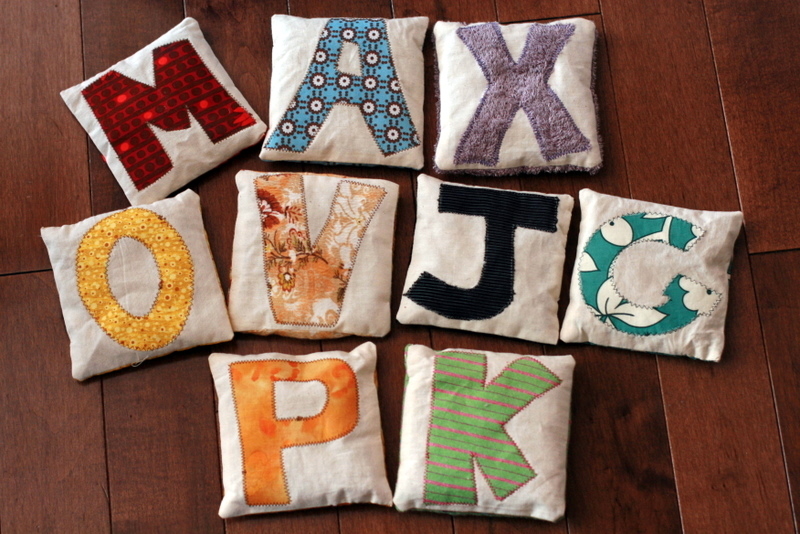 There are a bajillion tutorials out there for alphabet or number beanbags and they are all so cute. I really liked the look of these though, so settled on using a coarse muslin for the front and matching fabric for the applique and back. I really like the classic look of them. And what great practice with appliquing! 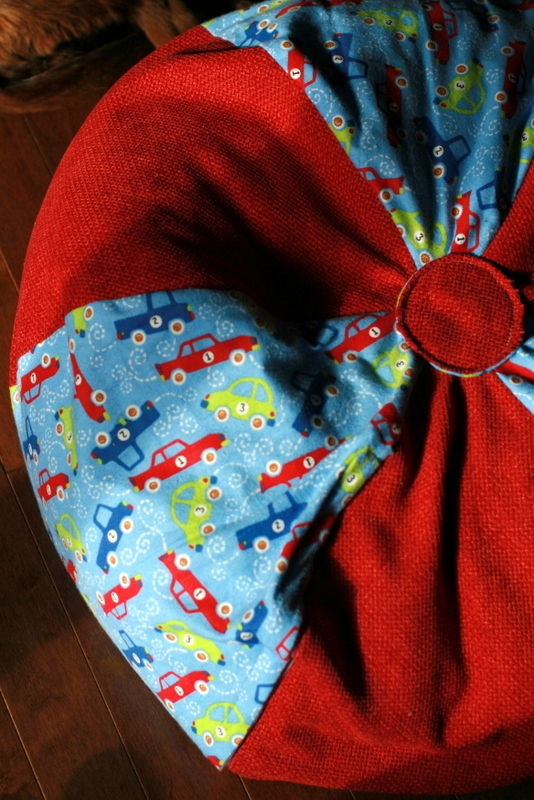 I absolutely LOVE how this beanbag chair turned out. And how cute is this fabric?! The pattern and tutorial came from here. This was a lot of fun to sew and I love that there is a cover that makes it washable (although the velcro enclosure was a bit tricky to sew). 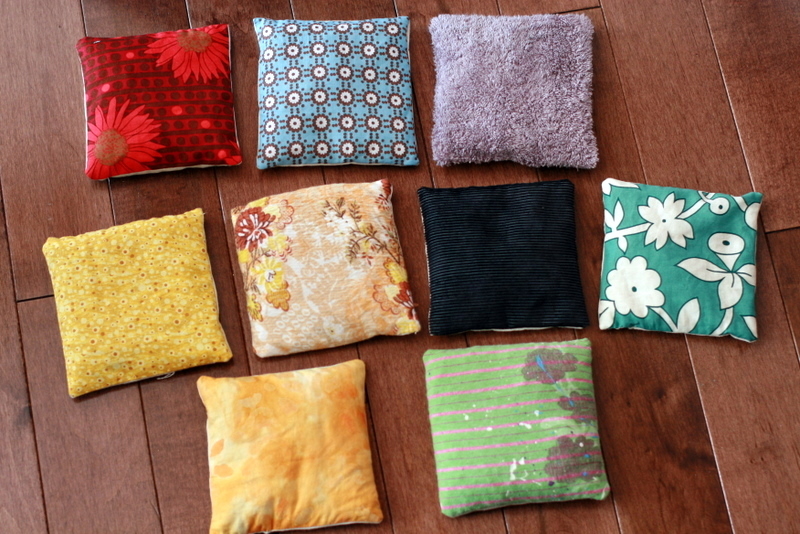 I am pretty sure I’ll need to make another one for Emery at some point. … and maybe daddy too? 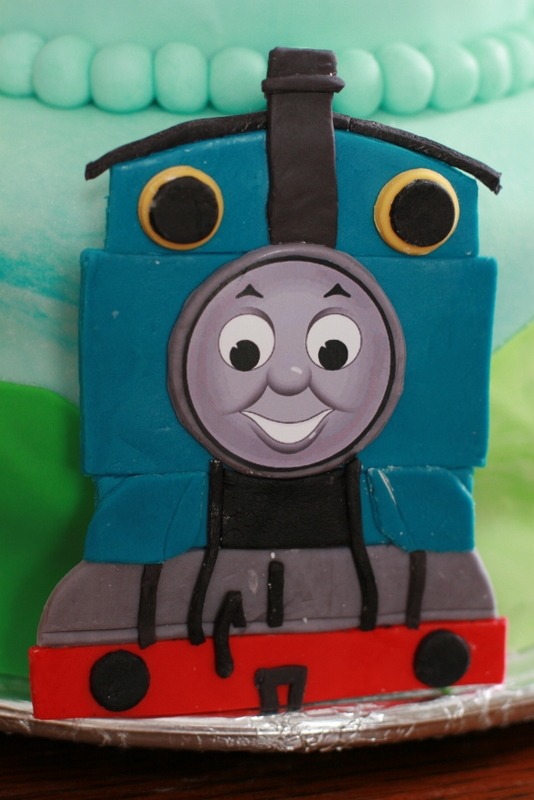 Oliver’s Thomas-themed cake was so much fun to make and so delicious, I thought I should do a separate post on it. I admit, at times I wondered why I was putting so much effort into a birthday party that Oliver wouldn’t remember but I really enjoy working with cake this way so … why not? I’m pretty proud of the result. First, the decorations. I started shaping the trains together a couple of weeks before the party. They are made out of marshmallow fondant, basically smaller pieces that were shaped and then “glued” together using water. My original plan was to pipe the faces onto the gray circles but when it came time to do them, it just wasn’t working – the piping was just too thick and not looking right. 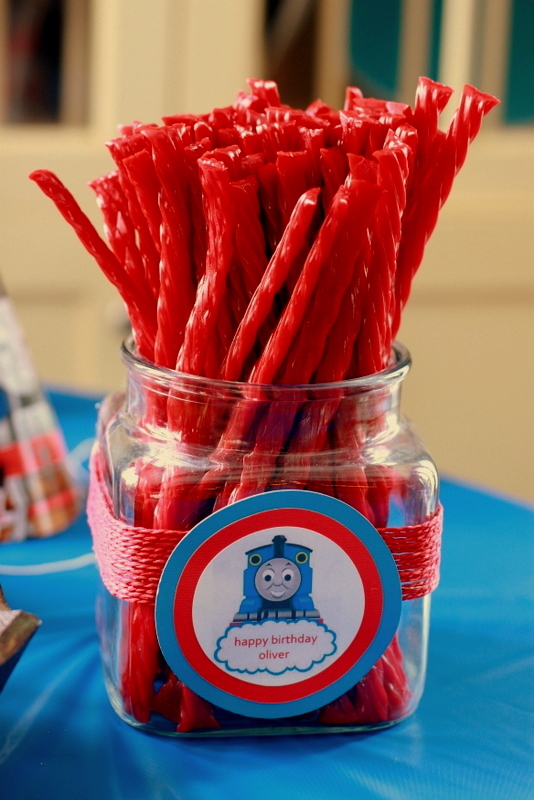 Since the trains weren’t going to be eaten anyway, we just printed the faces and stuck them on. I think they look great! A fancy decorated cake is all well and good but if it doesn’t taste good, what’s the point? This cake is three 9-inch chocolate cakes, topped with a 5-inch cake. 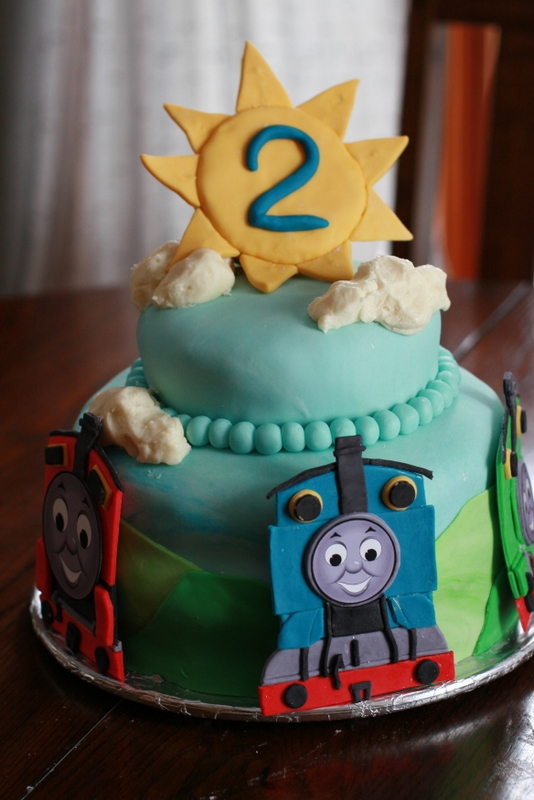 The cake recipe is from here and was delicious… perfectly moist and chocolatey even two days later. I think using chocolate chips instead of cocoa made a big difference. The cake was iced with white chocolate buttercream icing, found here. This is sucha a delicous recipe, one that I’m sure I will use again and again, but be warned: it does make a huge batch (much more than I needed, even with this much cake). To make the cake filling, I just added raspberry puree to the buttercream icing. So to recap: that’s a chocolate cake with white chocolate buttercream icing and white chocolate-raspberry buttercream filling. Yeah… it was so good it hurt a little. Microwave 1/4 cup of milk with the white chocolate for 1 minute. Stir. Continue to microwave 15 or 20 seconds at a time, being careful not to overcook the chocolate. Cream butter and shortening with an electric mixer. Add vanilla. Gradually add sifted icing sugar, one cup at a time. Beat well after each addition, being sure to scrape down the sides of the bowl. When all sugar has been mixed in, the icing will seem dry. Icing can be tinted any color. 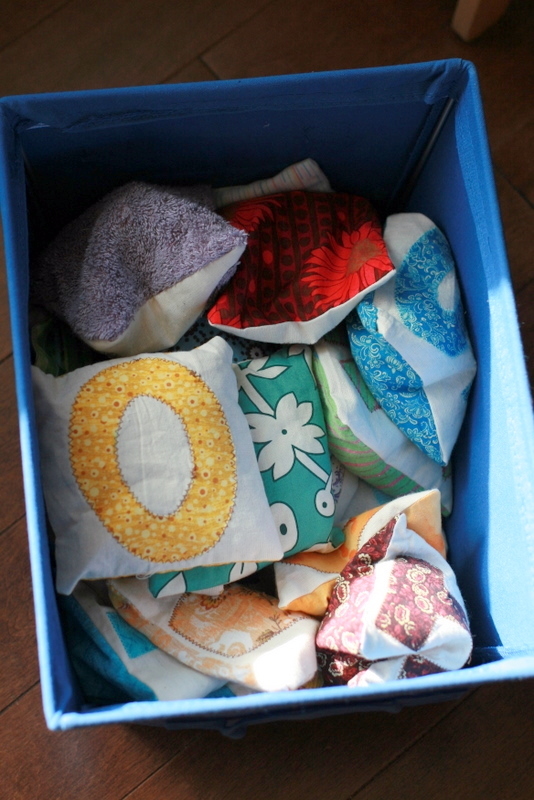 To keep from drying out, keep covered with a damp cloth until ready to use. Refrigerate or freeze. Categories: Craftiness, In the Kitchen, Oliver, Recipes: Desserts, Recipes: Oliver-approved | Permalink. I figure I’ll teach Oliver early that a birthday should really be more of a birth week than a birth day. That’s the way I’ve always done it after all! 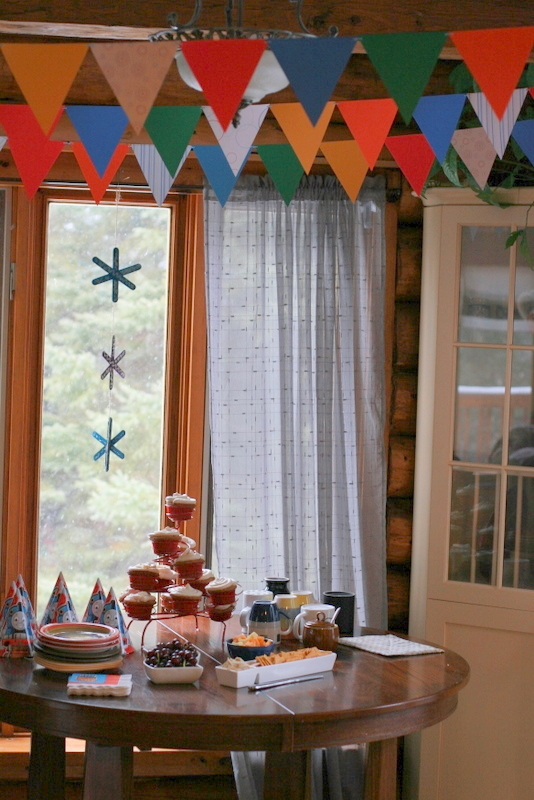 So this year we had two parties… a playgroup party with our friends and a second party with our family. All setup for cupcakes and snacks with the playgroup gals and the kids. 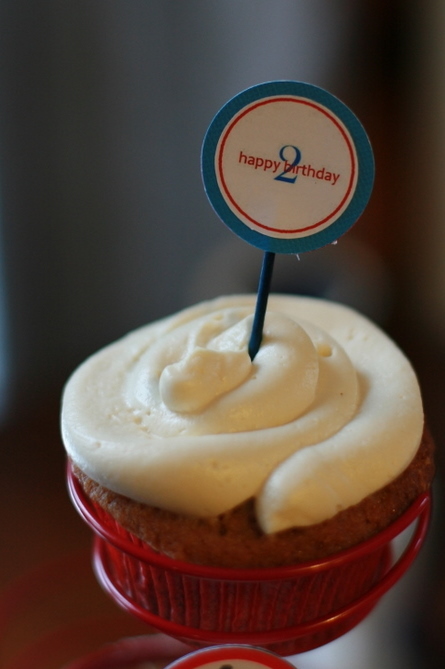 More on the cupcakes later! 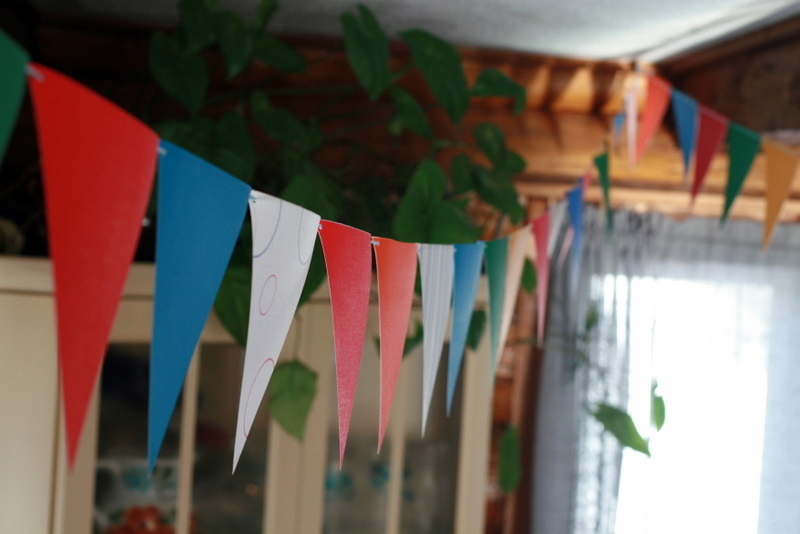 Pretty bunting … scrapbook paper strung together with blue twine. It is so bright and cheery I think I’ll leave it up for a few weeks! 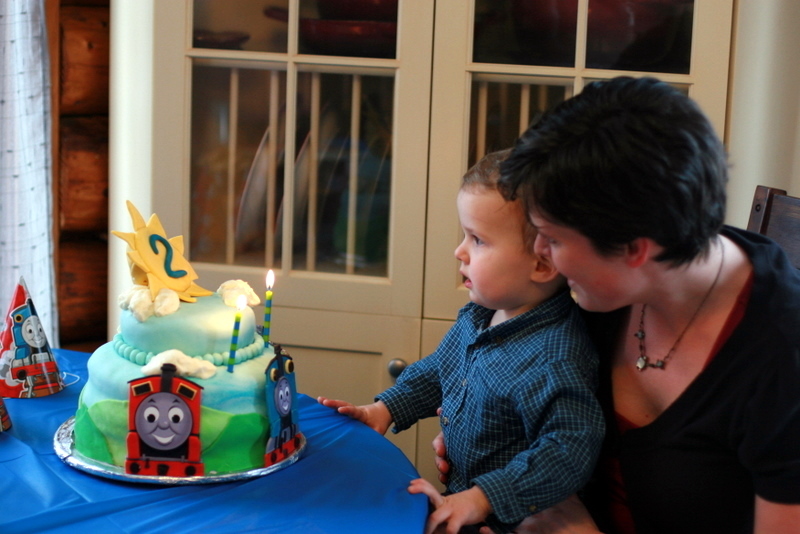 Oliver loved his Thomas birthday cake but just wanted to stare at the lit candle. More on the cake later. 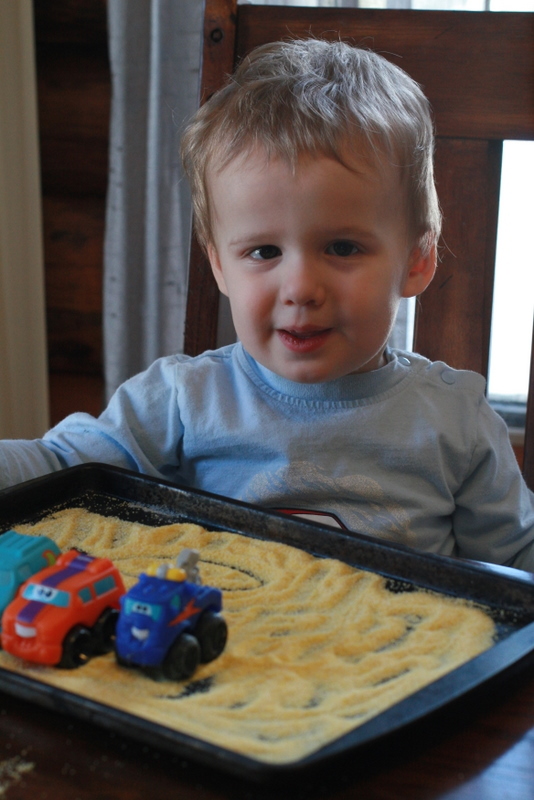 There were lots of really nice gifts, including this really thoughtful handpainted train from aunt ali. Oh, there she is with Nana! Daddy’s pooped after the party! Categories: Craftiness, Family Fun, Oliver | Permalink. 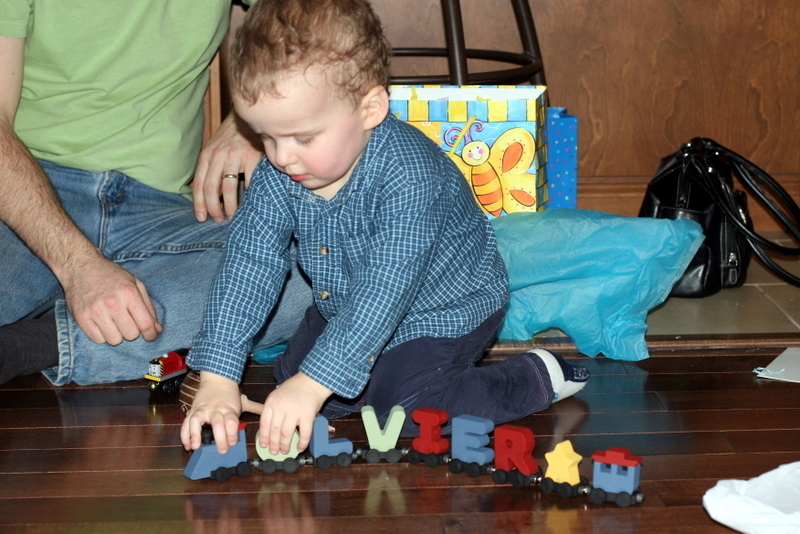 Happy 2nd Birthday to Oliver! It seems unreal that it was two years ago that I was at the hospital, awaiting your arrival. It’s so cliched it’s sickening but I’m really not sure where those two years have gone. I love watching you learn new things, try new words, figure out new games. Your little mind is like a crazy little sponge that just puts me in awe of you every day. 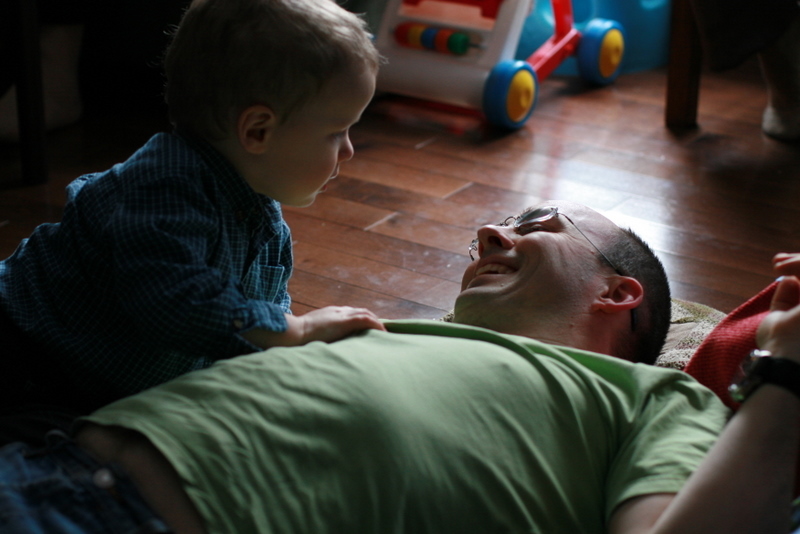 Your favorite person after mommy and daddy is “Papa” (and he loves you too)! And we found out today that you likely need glasses so you continue to be good at keeping us on our toes! 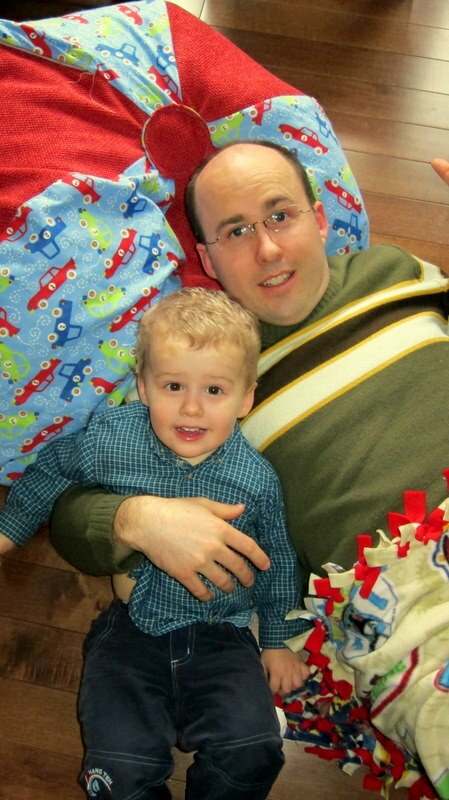 Categories: Musings as a mom, Oliver | Permalink.